This bee might be in for a bit of trouble. If “Feed me Seymour!” is the first thing that comes to mind when you hear the term “carnivorous plants” you are probably not alone. Have you ever seen a carnivorous plant? Did you there really is such a thing — it’s not just someone’s imagination gone wild. Some carnivorous plants are even native to our region? And guess what, we’ve got a special treat for you: Here at Lewis Ginter Botanical Garden, there is a very unique area, the Martha and Reed West Island Garden, filled with a variety of carnivorous plants! This garden is comprised of three islands built to highlight the natural beauty of a wetland environment, specifically featuring plants native to this region. 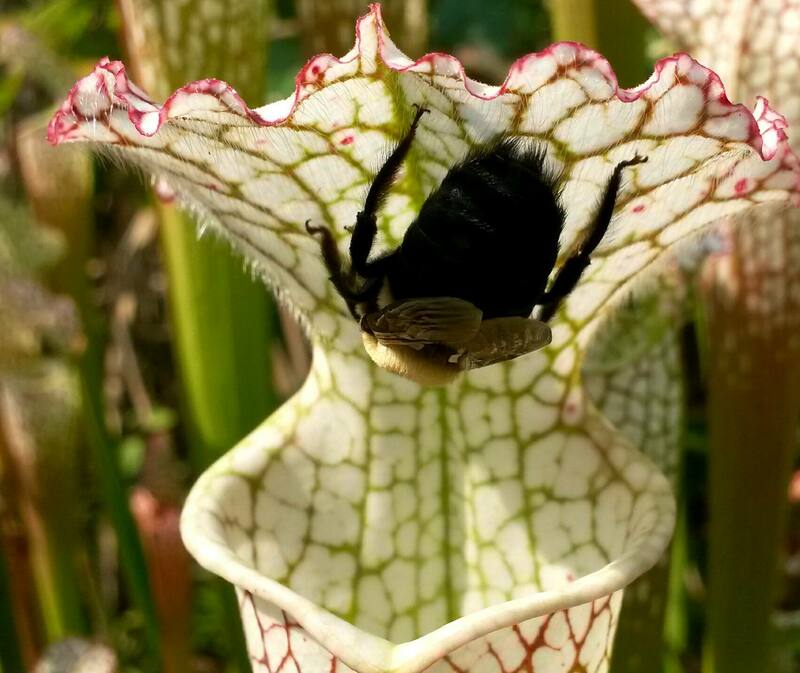 The most unique of these plants are the carnivorous plants. 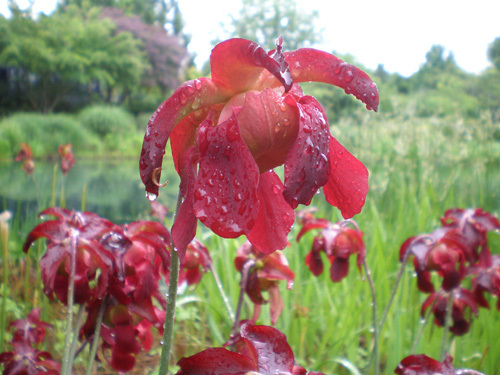 Sarracenia in the West Island Garden. Carnivorous plants grow in environments that are very challenging. Typically the wetland soil they grow in has little to no nutrient value. The plants are able to thrive in this environment because they can do what no other plants can do — eat bugs. There are many species of carnivorous plants in the United States, most of which are found in the Southeast. In fact, there are several species found here in Virginia, including pitcher plants (Sarracenia) and sundews (Drosera). 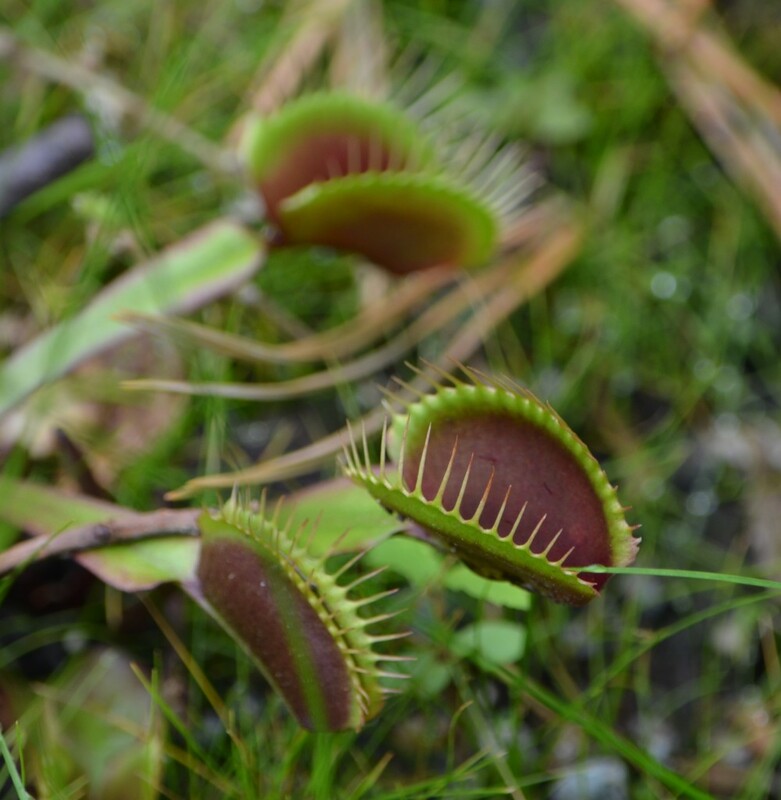 If you travel to North Carolina, you will even see Venus fly traps or Dionaea muscipula. Venus fly traps or Dionaea muscipula. The reason you probably have not just stumbled across any of these plants is because their habitat is one of the most endangered ecosystems around. Estimates show that only about 2.5 percent of the pitcher plant habitat that existed pre-European colonization still remains. Development, lower water tables, poaching, fire suppression and many other factors are all contributing to the loss of the specialized habitat these plants need to survive. There are many groups working for the conservation of these unique plants. 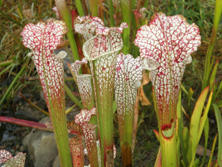 The North American Sarracenia Conservancy and Meadowview Biological Research Station (located right here in Central Virginia) are just two examples. Here at Lewis Ginter Botanical Garden we are committed to the conservation of these rare species. Stop by and have a look for yourself at some of the more interesting oddballs of nature. And don’t forget to come back in summer to see their alien-like blooms too! Pitcher plant bloom (Sarracenia leucophylla).